„ Starting November with a Bang! „ Not Just Another pretty Face! Friends! „ A Red Hat Day! 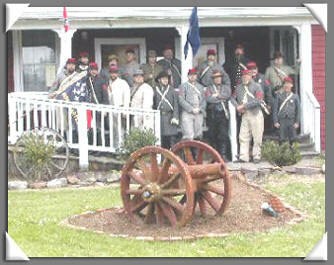 The annual meeting for the Brandy Station Foundation will be held March 2nd, 2007 at the Brandy Station Fire Hall. The event will last from 6:30 to 9:00 and our speaker will be Joe McKinney. As usual, the food will be great and there will be plenty of it!! The price of an admission ticket is $20.00 if reserved by February 19th and $25.00 thereafter. 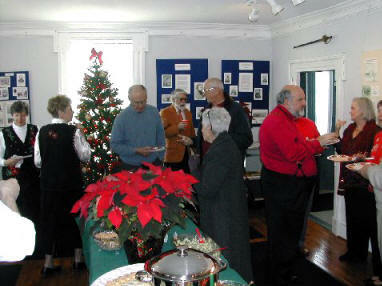 Requests for tickets should be directed to “Annual Dinner”, c/o Brandy Station Foundation, P.O. Box 165, Brandy Station, Virginia 22714. 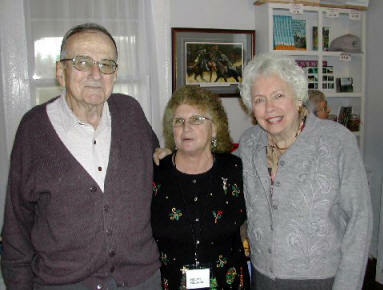 It’s a great way to see old friends in the midst of a cold winter. Come on out for a few hours of fun and festivities! The Front Line - Volunteers in Action! Sign Up Now. A training session for volunteers at the Graffiti House, including tour guides and greeters, has been scheduled for Saturday, March 17th at 2:00PM. Come on out and make some new friends! Contact Della at della_e@hotmail.com or call 540-825-4543 for more information. The Pfiles Go Back to School! On October 26, Bob and Shirley Pfile represented the Brandy Station Foundation at the annual Leadership and Career Academy panel presentation sponsored by the Culpeper Public Schools. They joined approximately 20 separate organizations from government and the private sector. The purpose of the presentations was to acquaint nearly thirty high school students with volunteer and service opportunities in the Culpeper area. The Work Goes On. On October 28th, Rich Deardoff, a teacher at Fauquier County High School, enlisted the help of his energetic history students to work at the Graffiti House. Some students freshened up the house exterior with paint and gardens with mulch; while others winterized the house by insulating with caulk and plastic. Other students helped tidy the grounds by sorting through mounds of bricks. Many thanks to Jim and his students! Hot off the Press. 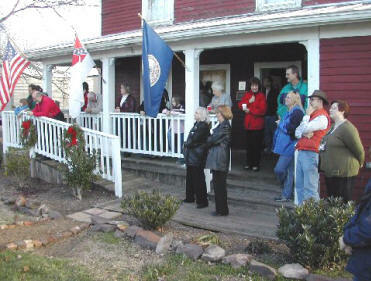 Sales of Volunteer Joe McKinney’s latest book, The Battle of Brandy Station; the largest Cavalry Battle of the Civil War continue strong at the Graffiti House. Stop by the Graffiti House gift shop to pick up your autographed copy! You won’t be disappointed! November 4th will long be remembered at the Graffiti House. 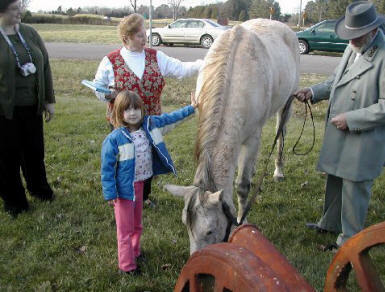 On that day, large groupings of home schoolers, Brandy Station and Culpeper natives, and interested others stopped by and watched the artillery demonstration by the First Stuart Horse Artillery. 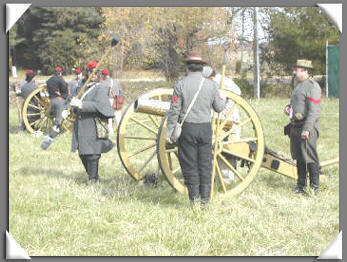 The Horse Artillery, based down the valley, traveled to Brandy Station to provide a first class demonstration of the prowess in the science of artillery. As you can see in the pictures, a good, safe time was had by all! Well - Santa was a no show – but he was the only one!! A happy crowd estimated to be 100 strong came to the Graffiti House on the afternoon of December 9th and had a great time. The food and drink were great, the strolling musicians outstanding and even Robert E. Lee (portrayed by Richard Watts) found time to drop by! Additionally, late in the afternoon, a group of Little Fork Rangers rode over and treated the party crowd to a selection of Christmas carols. 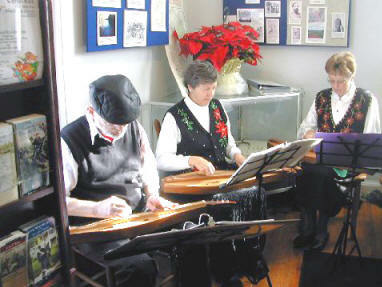 As the pictures below relate, the Christmas party was a reflection of the holiday season and good cheer was had by all. One of the more interesting characters whose name appears on the walls of the Graffiti House is that of Robert (Bo) Peed. Mr. Peed had a checkered war record with the Confederate Norfolk Light Artillery – but did manage to sign the Graffiti House walls in four places. In two of the four locations signed by Mr. Peed other names also appear on the wall, but up to now, those names were not able to be interpreted. However, thanks the recent gift by Wayne Mills to the BSF of a complete set of 128 volumes of the Official Records (OR) of the War Between the States – and some luck – those names have now been interpreted. In the small front upstairs room, across the room from the first of Mr. Peed’s signatures, two names were written along with what appeared to be a battery designation. The battery designation appeared to say Garnett but no battery of that designation could be located. However, working from the OR and the order of battle for the Gettysburg campaign found within those volumes gifted by Mr. Mills, the name of Lt. Col. John Garnett was located. 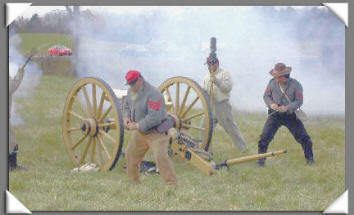 He was identified as the battalion commander of four artillery batteries; one of which was the Norfolk Light Artillery. Since one of Lt. Col. Garnett’s batteries of responsibility was the Norfolk Light Artillery, the question occurred whether the two names located near Col. Garnett’s name could also be from the Norfolk Light Artillery. A check of the wall names with a roster of the Norfolk Light Artillery identified that the two names on the wall, Edward Moreland and Robert Lewis, were indeed members of that unit. Later, Mike Block pointed out that another Robert (Bo) Peed signature, located in the hallway, also appeared to have a Garnett reference. Mike was right, it did. And even more importantly, there appears to be another soldier name referenced immediately to the left to the Garnett reference. Could this be another Norfolk Light Artillery soldier? Unfortunately, the quality of the graffiti is much degraded with this last signature and more research is required! But if it were to be of the Norfolk Light Artillery it might provide additional information that could identify when the walls were signed by the men of this unit. We’ll keep you informed as developments occur. Recently, the Brandy Station Foundation submitted two grant requests to the State of Virginia for support of key projects. A grant request of $44,000 was submitted to office of the Governor for inclusion in the 2007 Virginia state Appropriation for Non-state Agencies. The grant will aid in care and preservation of the Graffiti House. A Transportation Enhancement Application (TEA-21) grant request of $80,000 was also submitted. This grant request would provide funding (80%) to properly mark the 34 acres of land identified as Gregg’s Approach, install a walking trail over the property together with fencing, landscaping and parking. The last 20% of required funding would be the responsibility of the Brandy Station Foundation. Now, Susan Gray, Andrea Loewenwarter, Kerstin Travers and Chris Martin had come to pay a reciprocal visit and to share with us some of their experiences and documentation. To say that their visit was important is an understatement. First, they were able to share some of their experiences relative to fund raising and second, they were able to share some of the documentation that had proven essential to produce to facilitate the fundraising process. But there was even more! Kerstin Travers, a Conservation Technician, had brought some of her tools and asked permission to “play with the Graffiti House walls” Her tools consisted of a single safety razor blade and a rag to keep it clean. She went upstairs and randomly chose five wall areas to “clean” By the time she was done, she had found one new name, fleshed out a wall drawing, and excavated about 4 square inches of new plaster following a graffiti line. And all the time she needed was twenty minutes!! By visits end, the entire team from Fairfax was very excited about the possibilities of further research at the Graffiti House and believes that we have a true historical gem! We in turn, think that we have found some kindred spirits within Fairfax and look forward to future collaborative opportunities with them! 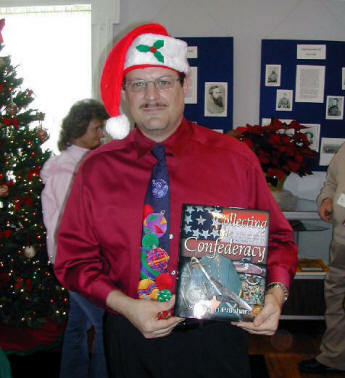 The symposium designed in partnership with Germanna Community College and planned to be the first comprehensive presentation of research to address the “Great Union Winter Encampment 1863-64” and slated to occur March 24, 2007, has been cancelled. “It was a very difficult decision for the Board” stated Bob Luddy, President of the BSF, “but I believe it was the correct decision. I have the highest regard for the Germanna Community College and I am grateful for all the support that they provided to us in attempting to make this symposium a vital event. However, the feedback that we received from the academic and civil war communities indicated a general lack of interest in a discussion of the Winter Encampment at this time. We (the BSF) will evaluate what we have learned from this experience and will apply this learning to the possible conduct of future symposiums by the BSF”. Charles and Linda Asbell of Greenville, North Carolina recently joined a select group of the descendants of participants in the Battle of Brandy Station. On November 4, 2006, they traveled to Brandy Station to participate in our artillery festivities and are pictured after signing the wall in honor of Charles's great-great-Grandfather, Pvt. James Asbell, 2nd NC Cavalry, Co. K. Pvt. James Asbell was wounded on June 9th, 1863 on Yew Ridge just before Col. Solomon Williams was shot in the head and killed. Private Asbell also suffered a head wound, but survived after he was transferred to Chimborazo Hospital in Richmond. After the war, Private Asbell grew a beard to help cover the wound to his face. Another relative, Henderson Asbell, was with the same unit and was captured at Beverly's Ford on the same day. He was later paroled at City Point, Virginia on June 30, 1863. According to family records, Henderson was the nephew of James Asbell. Needless to say, this was an important visit for Charles and Linda as well as the Foundation and we look forward to seeing them again! A Loaf of Bread, a Jug of Wine and a …TABLE? Many thanks to the Prince Michel Winery for their generous gift to the Graffiti House of 12 foot conference table. The gift will allow for both the display of exhibits within the Graffiti House and provide a working surface for meetings which occur regularly at the house. Thanks again. The BSF thanks Bud Hall for his recent gift to the BSF of a picture of JEB Stuart originally painted by John Paul Strain. 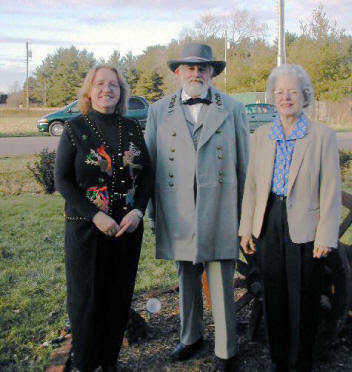 Mr. Strain’s work is well known within the civil war community as is the generosity of Bud Hall. On October 29th, the last Sunday seminar for 2006 was held at the Graffiti House. That seminar, unlike previous seminars, had no featured narrative presentation, but rather featured an afternoon of music from the civil war era. 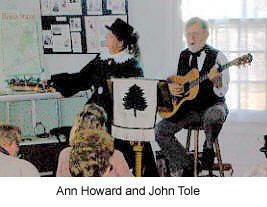 Evening Shade, also known as John Tole and Ann Howard, treated an overflow crowd with their own brand of guitar, banjo and tambourine arrangements. 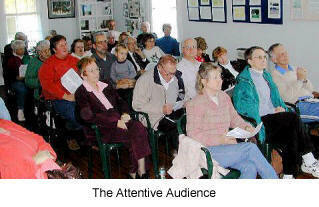 The crowd, estimated to be approximately 50, was the all time largest crowd for a Sunday Seminar series event. Thanks to John and Ann for providing a great ending to a very successful season of Sunday Graffiti House events. 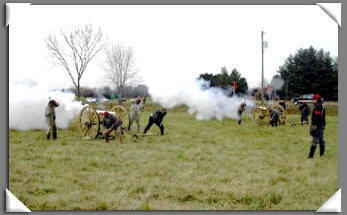 Total tour visitation to the Brandy Station Battlefield virtually doubled in 2006. 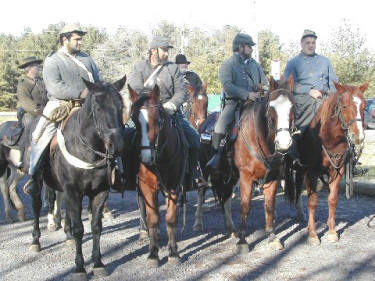 In 2006, a combination of horse and foot tour visitors, led by Brandy Station Foundation guides Gary Wilson and Joe McKinney, totaled 122 compared with only 66 in 2005. These numbers not only speak to the expertise of Joe and Gary, but also speak to the fact that more people are being made aware of the services offered by the Foundation. Great job guys!! It wasn’t quite Halloween – actually October 28th to be exact – but the bargains were flying just as fast as the goblins and ghosts on Halloween at the Brandy Station Fall Yard Sale. A rush of bargain hunters arrived in concert with the sale materials ensuring that a good day would be had by all. By noon, most of the sale materials had been purchased and a nice profit had been garnered for the Brandy Station Foundation. The day was such a success that additional sales will be held next spring and summer. Many of you may have seen them – or perhaps are members of them – The Red Hat Society. Composed of ladies whose age exceeds 50 and whose spirit is still that of a younger time, the ladies, dressed in purple outfits and red hats, have become a fixture in American society today. So it came as no surprise that a local Red Hat group visited the Graffiti House on October 1st. The ladies sparked up the afternoon and had a great time. 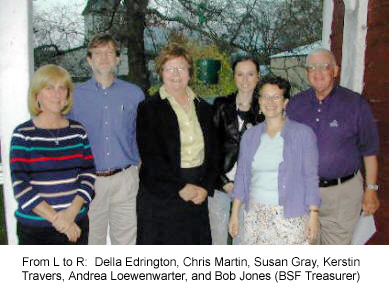 If you have not already done so, please renew or apply for your 2007 BSF membership. Click here, then print the renewal/application form. Fill out the form and send it today with your tax deductible donation. We depend on your support! !